House Swapping 101: Is a Home Exchange Right for You? Two facts about me: I love to travel, and I am so cheap you’d think I lived through the Depression. International travel is expensive enough, you would think these two facets of my personality would cancel each other out, and I’d never go anywhere. Not so. I am also stubborn, so my cheapness only spurs me on to creativity. In my search for an affordable way to see the world, I discovered house swapping. The basic concept is you go live in someone else’s home while they come live in yours. The execution is a great deal more complicated, but that’s the gist of it. If you’d like to see it played out on screen, you can rent The Holiday with Jude Law and Kate Winslet. There’s a delightful scene involving napkins, but it’s not particularly informative about the process. I also can’t guarantee that you’ll fall in love with anyone while on vacation. Once you have active listing(s), you can start emailing properties in countries or cities that appeal to you. While this is most often used for international travel, you can do domestic swaps as well. This part of the process can take awhile. Depending on how flexible you are on destination and dates, it can take a lot of emails to find a swapping partner. When we went to Queensland, Australia, it only took one email because they found us. When we went to New Zealand, it took 200 emails. 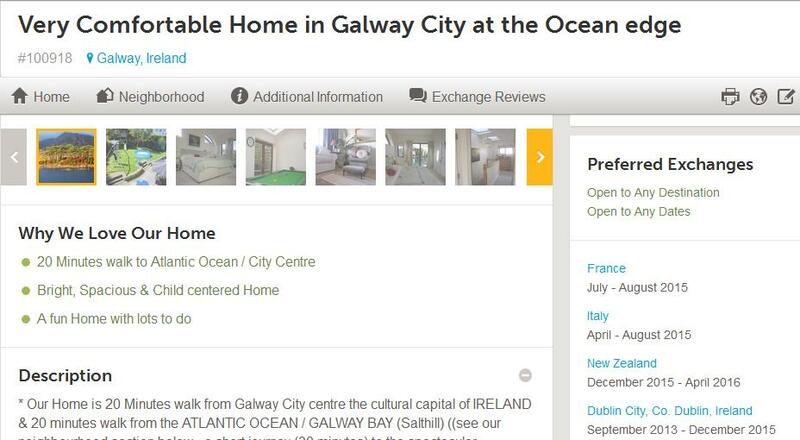 Here’s a partial listing for a home in Galway, Ireland from one of the largest swapping sites, HomeExchange.com. What’s the Benefit of Swapping? The biggest benefit is cost savings. When traveling internationally, the items that are the most costly are plane tickets, lodging, transportation in country, and eating out. With house swapping, you eliminate the lodging cost and may greatly reduce the last two categories as well. At least half of our exchanges have also included a car exchange. We drove their car(s) while they drove ours. We both had to pay for fuel costs, but that was still considerably less than if we had to pay for rental cars or train passes. Having a home base instead of a hotel room also means access to a real kitchen. We still sampled the local cuisine from time to time, but we weren’t forced to eat out every meal. It was also fun cultural experience to shop and cook with the local ingredients. The house we stayed at came complete with cooking magazines. Aussies are nuts about meat pies and puff pastry is cheap and available in every grocery store. 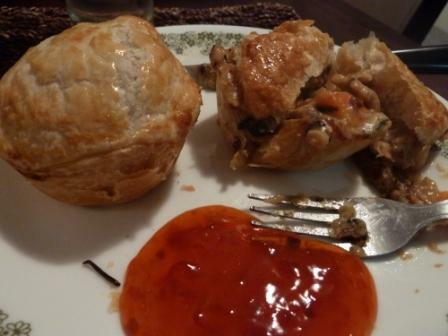 I had loads of fun trying out this meat pie recipe, which was delicious. You also get a much more realistic experience of the country. We have traveled where we stayed only in hotels or hostels interacting only with other foreign visitors and only visiting the major tourist destinations. With swapping, you stay in neighborhoods with the locals, shop with the locals, and stumble upon hidden treasures you never find in a guide book. Also, over the months of planning the swap, you get to know your swapping partner pretty well. They can also guide you to sites and experiences you wouldn’t otherwise know about. Now this depends on your work schedule, but because swapping allows your money to stretch further, you also open up the possibility of longer stays. Often your swapping partner will want a longer stay, too. Only in the United States do we feel two weeks in an adequate vacation time. We have found people who will do less than a month, but expect most exchange partners to want at least three weeks. Our Australians wanted six months. Perhaps you love going a hundred miles an hour all day sight-seeing and then want to go to the local clubs after. Maybe you like hotel rooms with maid service and the tiny shampoo bottles. I, however, am a homebody that likes peace and quiet after a long day exploring. I find one of the best parts of swapping is coming home to a home. I crawl into a bed that has become familiar, drink tea out of the same mug, and don’t hear any fellow tourists partying into the wee hours. What Are the Drawbacks of Swapping? First and foremost, they require a lot of planning. There are many details to work out between you and your exchange partner. 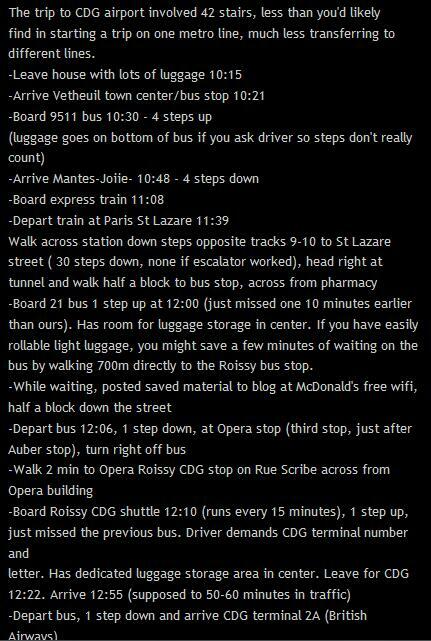 Also, because you aren’t doing the normal tourist thing, you often have additional planning. You might be staying a little bit further away from the major sites because that’s where you found a swap, so that requires extra planning and research on how to get from where you are staying to where you want to go. Because you are doing your own cooking, you might be packing meals and taking time out for grocery shopping. You have to locate and navigate a grocery store. When you fly in, there’s no hotel shuttle picking you up, so you have to arrange a way to get to where your swap is. If you are staying longer than the normal visitor, there might be visas to look into. None of these are insurmountable, and I’ll be doing a post that helps you consider these extra details. Still, if you prefer the sort of vacation that is preplanned and prepackaged and all you have to do is show up, then swapping is not for you. An excerpt from a blog post my husband did on how to get from the tiny town of Vetheuil to Charles DeGaulle Airport in Paris using only public transportation and hauling 50 pounds of luggage. This took him so much planning and research, he posted the entire process in the small hope it might be useful to someone. If you are really particular about your possessions and privacy, the whole idea of this might freak you out. We have a cat who still has her claws, which dictates that it’s best if we don’t own nice things. When at any moment what you own could be shredded or have a hairball coughed up on it, you learn to hold things loosely. House swapping does have some built in protection, though. True, your exchange partner could be trashing your house, but they are also aware that at that very minute you could be trashing theirs. It tends to keep people polite. That said, we usually put sensitive and hard to replace documents (birth certificate, SS Card, etc.) in a small box along with the one piece of nice jewelry I own, and give it to a trusted friend for safe keeping while we are gone. Not that I’ve ever suspected the people we would swap with would ever do anything with them, but it gives you piece of mind that those things are secure while you are gone. Likewise, we have come across locked closets, drawers, and even garages in our swaps that I suspect were serving a similar purpose. The biggest drawback, though, is when things go wrong, you have to deal with it. On any trip, there’s a chance something unforeseen could happen, but usually if you are doing the normal tourist thing, there’s someone else to call to take care of it. For example, in Spain a gust of wind from the window knocked over a lamp and broke it. If we were in a hotel, we’d just call the front desk, explain, and be done. Because it was in someone’s home, we had to replace it. It turned out to be easy because we were shopping at the local stores, and I spied the same exact lamp. Sometimes, though, the problem is not so easily solved. When we were driving in northern Queensland, we hit a kangaroo. They’re like deer up there, a pest that just runs into the road without warning. If we had been driving a rental car, the company would retrieved us, given us a new car, and our credit card offers us rental car insurance, so we wouldn’t even have had to pay for the damage. Instead, we had to locate a tow truck, get back to the nearest town, and pay for a hotel for three days while the insurance got worked out. Then we had to rent a car to drive back to our swap, pay the $500 deductible on the car insurance, and wait a month for the car to be fixed because it takes so long for parts to be shipped to Australia. In the meantime, we couldn’t drive anywhere without paying for another rental car. It still likely cost us less than renting a car for the four months we were there, but it was a lot to deal with.